Jennifer Eason, owner of Jennifer’s Edibles, poses in front of a store menu. The restaurant, 1623 Simpson St., received both a microloan and business services through LEND. After funds were disbursed this summer, recipients of LEND’s Entrepreneurship Support Program have expanded their outreach, using microfinance to drive growth. The $300,000 annual program was designed by LEND — a Northwestern student-run microfinance organization — specifically for low-income and minority-owned Evanston businesses. It provides clients with direct capital and services like marketing strategies and legal aid. 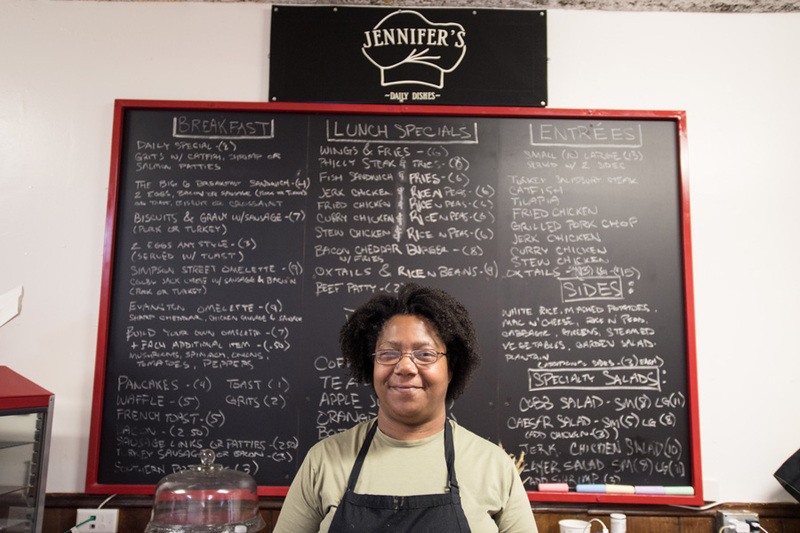 Jennifer Eason, a member of the new program and owner of Jennifer’s Edibles, said LEND helped her add essential equipment to her comfort food restaurant in west Evanston, which opened in January. Many small business owners who seek loans or capital, especially those with poor or nonexistent credit scores, are turned down by banks. Eason said because her personal credit “wasn’t stellar,” she could not find a bank willing to help get her business off the ground through commercial lending. “(Groups) like LEND that don’t deal with just credit scores — and deal with the actual person and let your track record speak for itself — they’re a much more personable service,” Eason said. In addition to the program’s low-interest microloans, Eason said LEND was “a complete package opportunity” and helped her draft a comprehensive business plan as well as modify her menus to reach more types of customers. Petra Barbu, vice president of marketing and outreach for LEND, said Jennifer’s Edibles is one of three companies selected for the program since May. LEND itself provides up to $10,000 in optional capital loans to program recipients, and the Evanston Economic Development Fund grants business services valued between $2,500 and $3,500. “Having this cycle where (funds) are locally sourced, where we’re giving it to local clients and where we’re doing it with a local program is so important for keeping it in the Evanston community,” Barbu said. Ald. Robin Rue Simmons (5th), who is the program coordinator for Sunshine Enterprises, a company that trains and mentors small business owners, said many graduates of her company’s 12-week business academy look to LEND for help overcoming credit barriers. Barbu echoed Simmons, saying that ties between Sunshine and LEND are strong — three of Sunshine’s business academy graduates applied and were accepted to LEND’s new program. This fall, LEND will work with six additional Evanston businesses, Barbu said. Besides the monetary and economic benefits, Simmons said the program helps bridge some of the inequities present between west Evanston and other parts of the city. Economically empowering Evanston residents gives people an avenue to develops their ideas in a way that “really brings the community forward,” said Suhaib Khan, LEND’s vice president of client services.